American Craft Beer Prices – Again! American craft beer prices continue to climb. There seems to be no stop in site. It drives me to home brew more often in spite of a crazy busy day-to-day schedule. Only one beer under $10.00. And, that beer, when I originally had it was only $6.99. That is a $2.00 price hike or, more meaningful, a 28.6% price hike. Other beers, on the list above, that I have reviewed on Two Beer Dudes, have had similar price hikes (why logging this crap is so important). 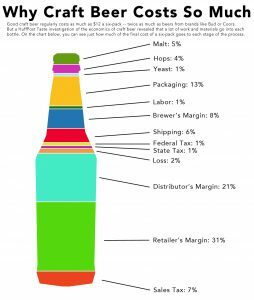 According to the graphic (huffingtonpost.com) some 52% of the cost of American craft beer comes from the distributor and retail markups. Never thought it was that much. Wait. Why does beer still cost so much when purchased directly from the brewery? Craft Beer Destined for Big Crash? Some of the articles above were speculative. Surprisingly, possibly not, but some of those have come true. Especially the post on American craft beer limited lease price increases. The only way that change will occur: people have to stop paying the rising prices for American craft beer. But, the fever is on, it is the in thing. This is scary similar to the wine industry some 15 – 20 years ago. Prediction: I think that the American craft beer bubble is going to burst in the next three to five years. In the meantime, make mine a home brew. Enjoy! Useless Fact: There are 318,979,564,000 possible combinations of the first four moves in Chess. Posted in Beer, Lounge | Comments Off on American Craft Beer Prices – Again! Why So Serious? American double India pale ale (DIPA) was brewed the morning that 12 inches of snow was finishing up. It made for a great outdoor photo, similar to the morning that I brewed with the Afro Six-Nine. 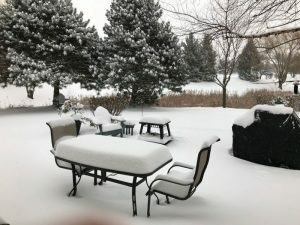 The evening of brew day, into the next morning, accounted for another six inches of snow. Nothing makes for a better day of brewing than the stealthy measures the snow uses to fall. The name of the home brew is actually my feelings about the American craft beer industry; I recently wrote about American craft beer prices. The industry has warped into this ridiculously serious market as the number of breweries increase and competition for shelf space as well as customer dollars has increased pressure for the ever increasing cost of equipment. I get it, but what ever happened to some of those fun American DIPA beers from the west coast that dominated up until a few years ago. I can’t find them. If I do, they typically aren’t fresh, therefore, if they don’t have date, I don’t touch them. This beer pays homage to those fun days of American craft beer gone forever. Another movie quote name. Expect to see a few more. This one is from The Dark Knight, one of my favorite movies of all time. Making an American DIPA was something that I really enjoyed: bitter, hoppy, and table sugar to dry. Forget about the malts…mostly. The malt was there to provide a malt backbone that was neutral, trying to balance, somewhat, without stepping anywhere near the path of the hops flavor, aroma, and bitterness. Oh, that beer needed some alcohol and needed to be have pristine clarity. West coast hops: Cascade, Centennial, Chinook and Columbus quickly come to mind. I didn’t have Chinook (really like that pine). I had to do my best with the other 3 Cs. Vienna malt was added for a touch of malt character and complexity. Sublteness is the intent. It is also a malt I have been waiting/wanting to use from sometime. The aroma on this beer while fermenting was enormous, it filled up the basement, greeting the senses half-way down the steps. Hopefully all of the goodness didn’t ferment out. Enjoy! 2018-02-10 (morning): @62.7*F, no/slow fermentation. 2018-02-10 (evening): @61.3*F, slow fermentation. Put on heat at 68.0*F.
2018-02-11 (evening): @66.7*F, great fermentation/aroma. 2018-02-13 (morning): @67.6*F, great fermentation/aroma. Set heat at 70.0*F.
2018-02-13 (evening): @69.4*F, good fermentation. Slowing. 2017-02-16: @68.0*F, no visual fermentation. Took off heat blanket. Useless Fact: 53% of women in America would dump their boyfriend if they did not get them anything for Valentine’s Day. 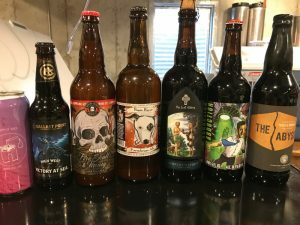 Posted in Beer Recipes, Home Brewing | Comments Off on Brewed: Why So Serious? You are currently browsing the Sips blog archives for February, 2018.